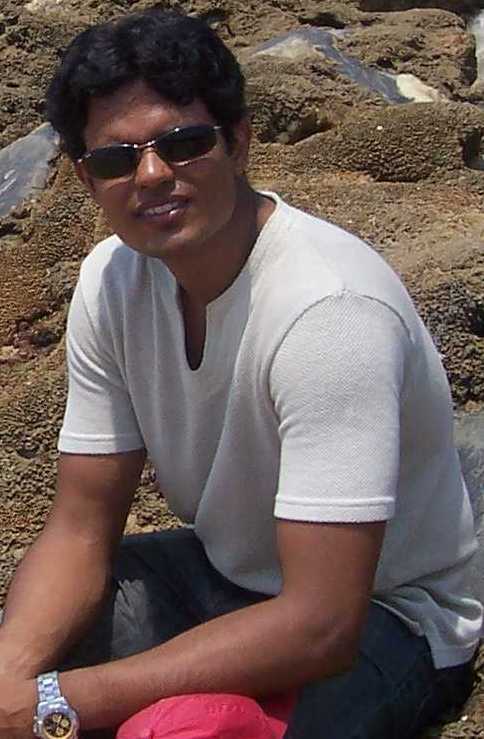 This is a dated post, going back to end-July 2011, the weekend just before the CAM ride. My work place was Huta Katowice at Dąbrowa Górnicza, the biggest steel producing plant in Poland. I was put up at Katowice, a neatly laid out city in southern Poland. Some quick enquiries at Hotel Angelo reception and some more Google maps browsing later, I had sorted out a route for an early morning run. The weather was perfect, the sun-rise at 5AM or so and Katowice is a safe city. My question if it was safe to run, was met by a rather surprised look at the counter and I was assured. I carried some cash and my mobile phone for insurance. So here I was, half way round the globe from home, glancing past signboards in foreign language, a map in hand, doing what I do best – Run. The 10km loop took me past the Silesia City Center mall with its antique tower and locomotive exhibits from its mining past, and past a Saint Barbara’s Chapel. A few hundred meters to the right was entrance to what looked like a massive park (it claims to be the biggest park in Europe). 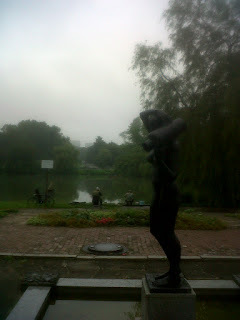 There was no a soul in this picturesque park, complete with floral statues, a Zoo, ponds, fountains and my favorite – the naked lady statue. I ran this Silesian loop on every chance I had – twice! Early on Saturday morning, I coaxed my colleagues into catching the 7am bus from Katowice to Krakow. I had made enquiries and spoken to a guide of a ‘cool tour company’ and had tentatively confirmed for the 10am bike tour. I had to scramble around to find the main square from where the bus dropped us. I had a map, but with markings in Polish, I ran around all directions before setting off towards the square. Eventually, when I found the office in Grodzka! the tour had just begun. I ran into the store and got myself a bike (a steel bike, with some basic components), filled out the mandatory forms and paid up. I joined the group, just as it made it’s way to the Main Market Square. The group itself was multi-national – Americans, to English, ppl from South East Asia and some Polish too! It was a chill morning with mild drizzle at times. The English-speaking guide kept us informed and in good humor, with the typical accent and a naughty smile. The Market square was bustling with activity, restaurants & pubs were filling up, tourists were everywhere, the massive but elegant horse drawn carriages or electric carts. We rode along clobbered roads past the Old University quarter to the remnants of the Old Town walls and the Krakow Main gate. 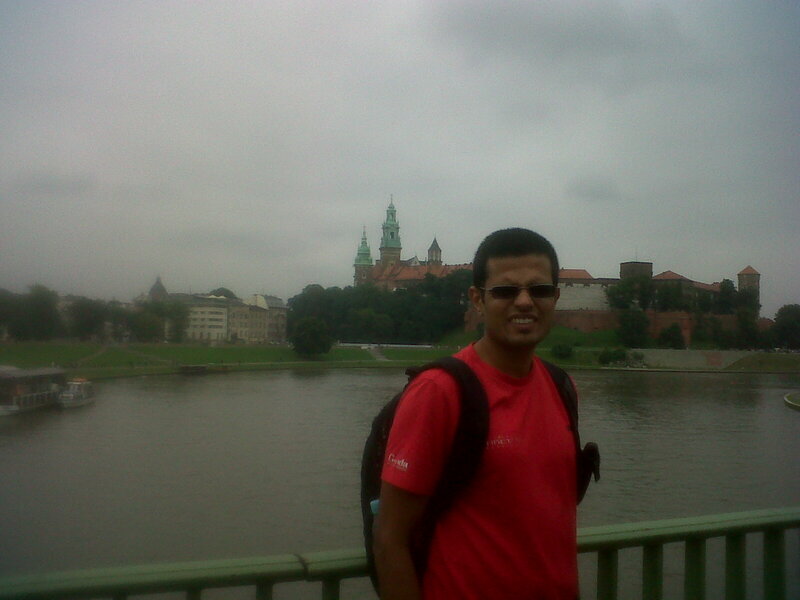 I was told here that Krakow was the historical capital of Poland. The knowledgeable ones in the group tested the guide with many questions on the history of the place. 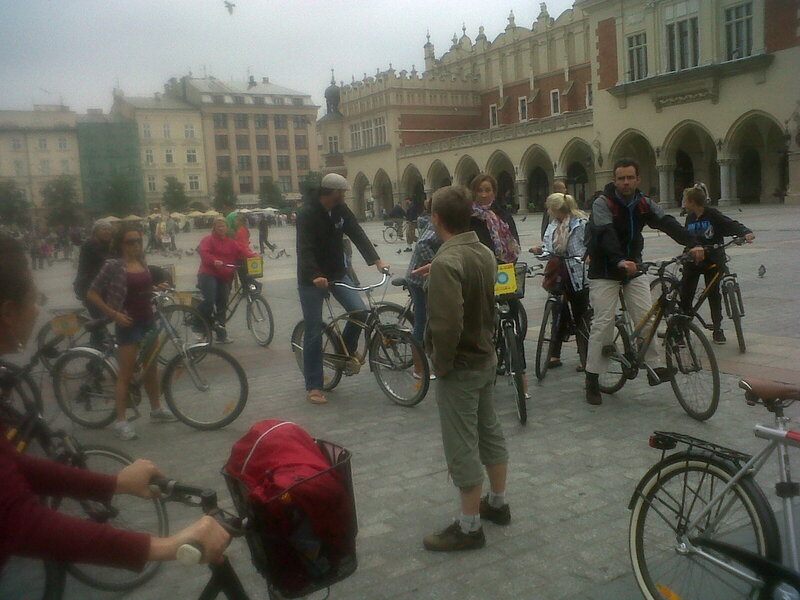 We then rode towards the Wawel Castle. I was surprised to find Amitabh Bachchan’s handprint etched in the walkway alongside other greats like MJ. We rode along the Vistula river, crossed over and rested at a waterfront restaurant over coffee. The ride then took up past the Jewish Ghetto area to the Oscar Schindler’s factory. The factory that was once dishing out Enamel dishes was taken over by Oscar Schindler during WWII. He started to save the Krakow Jews by employing them, by paying bribes and contacts and making a significant financial loss. A major part of the movie was shot at this site, where a museum preserves some of the machinery and products from the factory. The ride lasted about 4hours and we had covered close to 15kms! I made friends with a svelte marathoner from UK and her friend and an Englishman from Singapore and a brother-sister couple from Germany, who was a professional wine taster. After the ride, I settled down with my new friends in the Market square for some Paulaner Weiβbier. I took the last bus out of Krakow to Katowice after a memorable Saturday. Sunday was kept aside for a visit to Auschwitz, my (by now frequent) query at the reception led me to believe the bus to be taken was across the street. By now I have found a way to ask for directions – I carry a paper and pen and write down (say Oświęcim) and point to it. If the onlooker understands what I am saying, he draws the directions on the paper. All this to beat the language barrier. But on this occasion, I was astounded. I was (as usual) scrambling to find the bus stop for this bus and making futile efforts with my paper+pen method. It had begun to drizzle and I zipped up my jacket. I zeroed in on a elderly bearded man to ask for directions to the bus stop. He looked up at me, tried to explain in Polish, figured I didn’t understand a thing. Then, in a stroke of remarkable gesture, he beckoned me to follow him. Shielding against the heavy drizzle with his umbrella, he walked briskly, about a km to the bus station, checked the exact stop with the helpdesk and walked me all the way to the bus stop. I am not sure if it was my intended destination (Oświęcim) that evoked such reaction. I took the bus, then walked about a km to the Museum, bought the entry ticket and another ticket for the English guide. Little did I know, what I was to see would scar my memory forever. A poker faced lady was the guide for my group. We plugged in ear-pieces and tuned into Channel 9 as we walked around various blocks where Jews were kept, now converted into Museum displays. Most of the tour that was given to us by a lady was conducted in silence. There was nothing to say. Everything was before us to imagine and access what would have transpired there. Even though there are hundreds of visitors in several different groups that move about, not a sound is heard from anyone. No one speaks, and no one exclaims. A motley crowd of tourists simply walk about from one locale to another as though in a stupor. I will resort to shameless plagiarism here, for what I saw on Amitabh’s blog was very nearly what I would have described myself. 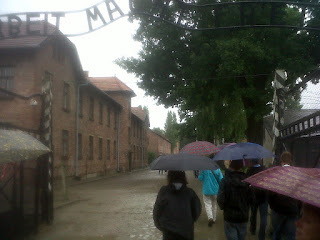 You can read all of Amitabh’s experience of Auschwitz on his blog here. I visited Auschwitz II as well to view the train that brought the Jews to the dreaded camps. The feeling was heavy when I left the camp. Although one full year has passed since I visited Auschwitz, the memory is fresh and no less depressing. The cherry on top was the Tour de Pologne. I was to leave Poland on Tuesday and there was a sudden spike in activity on Monday, 1st August at my Hotel Angelo. The tour of Poland was passing Katowice on Tuesday and the bikers were staying at Angelo! The taxi back from work had to take a detour to avoid the massive pile up and I had to take a tram to get near the hotel vicinity. I stood by the barricaded road and watched the bikers zooming past. They had to do 8 loops with about 15mins for each loop for this last leg in Katowice. To get to watch the Pro-bikers first hand was awesome. I bought a “Tour de Pologne” tee shirt as a memento. Tourists can make use of the Online Bus Reservation tickets facilites on TicketGoose.com to book their tickets. Ticketgoose.com Launched in August 2007 has been a leader in Ticketing Web Portal for Book Bus Tickets Online. Your Online Bus Tickets Booking is just a click away!